This ziftrCOIN Presale Purchase Agreement (this “Agreement“) contains the terms and conditions that govern your purchase of ziftrCOINs during the ziftrCOIN Presale (the “Presale”) and access to the Service Offerings (as defined below) and is an agreement between ziftrCOIN, LLC (“Ziftr”, “we”, “us”, or “our”) and you or the entity you represent (“you“). This Agreement takes effect when you (i) click an “I Accept” button or check box presented with these terms or, if earlier, when you use any of the Service Offerings, or (ii) when we receive payment in full pursuant to Section 3 (the “Effective Date“). You represent to us that you are lawfully able to enter into contracts (e.g., you are not a minor). If you are entering into this Agreement for an entity, such as the company you work for, you represent to us that you have legal authority to bind that entity. Section 15 contains the definitions of certain capitalized terms used in this Agreement. Though you should read and understand this entire document before agreeing to its terms, you should pay particular attention to those terms written in ALL CAPITAL LETTERS. 1.1 Generally. You may access and use the Service Offerings in accordance with this Agreement. You will adhere to all Ziftr rules and regulations applicable to your use of the Service Offerings, including the Policies as defined in Section 15. You have read the Ziftr Risk Disclosure and will read any updates thereto. 1.2 Your Account. To access the Service, you must create a Ziftr account associated with a valid e-mail address. You may only create one account per email address. You are responsible for all activities that occur under your account, regardless of whether the activities are undertaken by you, your employees or a third party (including your contractors or agents) and, except to the extent caused by our breach of this Agreement, we and our affiliates are not responsible for unauthorized access to your account. You will notify us immediately if you believe an unauthorized third party may be using your account or if your account information is lost or stolen. You may terminate your account and this Agreement at any time in accordance with Section 8. 1.3 Support to You. We will provide web-based support only, including email, web forums, and knowledge base support. We will not provide telephone or live support. Our support email is info@ziftrcoin.com. 1.4 Third Party Content. Third Party Content may be made available directly to you by other companies or individuals under separate terms and conditions, including separate fees and charges. Because we may not have tested or screened the Third Party Content, your use of any Third Party Content is at your sole risk. We do not accept liability for any fees incurred or damages caused by your use of any Third Party Content. We do not guarantee the availability of any Third Party Content for any purpose. We do not guarantee the accuracy or precision of any information provided to us by any third party, including, without limitation, network mining information, pricing information or other statistical data. 2. Changes to the Service Offerings and Third Party Content. We may change, discontinue, or deprecate any of the Third Party Content and Service Offerings (including the Service Offerings as a whole) or change or remove features or functionality of the Service Offerings from time to time. We will notify you of any material change to or discontinuation of the Service Offerings. 3. 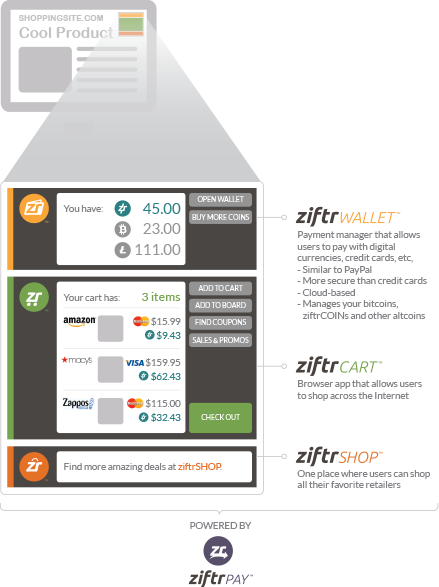 Purchase and Delivery of ziftrCOINs. 3.1 Purchase. You agree to purchase and we agree to sell, on the terms set forth herein, the number of ziftrCOINs offered by us and selected by you on the Ziftr Site. The price we charge and the terms we agree upon for any purchase of ziftrCOINs may change frequently during the Presale. We make no guarantee that you will be entitled to any term, including price, you may have agreed to at any other point during the course of the Presale, or any price that you may have seen advertised. We will accept payment in Bitcoins. Your purchase is final. We will not provide any refund of the purchase price under any circumstances. 3.2 Delivery. In or around February 2015, we will make available to you the ziftrCOINs you purchased under this Agreement. We will make these ziftrCOINs available to you by permitting you to access and use, as set forth herein, the ziftrCOIN Wallet associated with your account. 4. Security and Data Privacy. 4.1 Your Security. You will implement reasonable and appropriate measures designed to secure access to (i) any device associated with the email address associated with your account, and (ii) your username, password and any other login or identifying credentials. In the event that you are no longer in possession of any device associated with your account or are not able to provide your login or identifying credentials, we may, in our sole discretion, grant access to your account to any party providing additional credentials to us. We explicitly reserve the right to determine the additional credentials required, which may include, without limitation, a sworn, notarized statement of identity. 4.2 Additional Information. You will provide to us, immediately upon our notice of request, information that we, in our sole discretion, deem to be required to maintain compliance with any federal, state or local law, regulation or policy. Such documents include, but are not limited to, passports, driver’s licenses, utility bills, government identification cards, or sworn statements. 4.3 Your Information. We may use aggregate statistical information about your activity, including without limitation your activity on the Ziftr Site and logins to various websites for marketing or any other purpose in our sole discretion. However, we will not release your personally-identifying information to any third party without your consent, except as set forth herein or in any Policy. 5.1 Security and Backup. You are responsible for properly configuring and using the Service Offerings. Ziftr log-in credentials generated by the Service are for your internal use only and you may not sell, transfer or sublicense them to any other entity or person, except that you may disclose your credentials to your agents and subcontractors performing work on your behalf . 5.2 End User Violations. You will be deemed to have taken any action that you permit, assist or facilitate any person or entity to take related to this Agreement, or use of the Service Offerings. You are responsible for End Users’ use of the Service Offerings. You will ensure that all End Users comply with your obligations under this Agreement and that the terms of your agreement with each End User are consistent with this Agreement. If you become aware of any violation of your obligations under this Agreement by an End User, you will immediately terminate such End User’s access to the Service Offerings. 5.3 End User Support. You are responsible for providing customer service (if any) to End Users. We do not provide any support or services to End Users unless we have a separate agreement with you or an End User obligating us to provide support or services. (c) to provide any money services, including, without limitation, check issuing, cashing or selling, issuing or participating in a stored value program, providing prepaid access, trading, dealing or exchanging currency, or transmitting money. 6. Taxes. All fees and charges payable by you are exclusive of applicable taxes and duties, including VAT and applicable sales tax. You will provide us any information we reasonably request to determine whether we are obligated to collect VAT from you, including your VAT identification number. If you are legally entitled to an exemption from any sales, use, or similar transaction tax, you are responsible for providing us with legally-sufficient tax exemption certificates for each taxing jurisdiction. We will apply the tax exemption certificates to charges under your account occurring after the date we receive the tax exemption certificates. If any deduction or withholding is required by law, you will notify us and will pay us any additional amounts necessary to ensure that the net amount that we receive, after any deduction and withholding, equals the amount we would have received if no deduction or withholding had been required. Additionally, you will provide us with documentation showing that the withheld and deducted amounts have been paid to the relevant taxing authority. Our right to suspend your or any End User’s right to access or use the Service Offerings is in addition to our right to terminate this Agreement pursuant to Section 8. (a) By you: You may terminate this Agreement for any reason by closing your account for all Service Offerings for which we provide an account closing mechanism. You will be responsible for the disposition of any ziftrCOINs associated with any Service. (b) By us: We may terminate this Agreement for any reason or for no reason upon written notice to you. Within 30 days from the date of our sending such notice, you will provide us with a ziftrCOIN address you control. Unless prohibited by law or by the terms of this Agreement, we will use commercially reasonable efforts to return to that address any ziftrCOINs that are associated with your account. 8.3. Effect of Termination. Upon any termination of this Agreement: (a) all your rights under this Agreement immediately terminate; (b) you are not entitled to a refund of any amount paid; (c) you will immediately return or, if instructed by us, destroy all Ziftr Content in your possession; and (d) Sections 5.1, 6, 8.3, 9 (except the license granted to you in Section 9.1), 10, 11, 12, 14 and 15 will continue to apply in accordance with their terms. If we terminate this Agreement, and/or your right to access or use any portion or all of the Service Offerings, we will not be liable for any special, incidental or consequential damages you sustain, including without limitation any special, incidental or consequential damages due to any loss of login or user information for any website or your inability to access any website or account. 9.1 Service Offerings License . As between you and us, we or our affiliates or licensors own and reserve all right, title, and interest in and to the Service Offerings. We grant you a limited, revocable, non-exclusive, non-sublicensable, non-transferrable license to do the following during the Term: (a) access and use the Service solely in accordance with this Agreement; and (b) copy and use the Ziftr Content solely in connection with your permitted use of the Service. Except as provided in this Section 9.1, you obtain no rights under this Agreement from us or our licensors to the Service Offerings, including any related intellectual property rights. 9.2 License Restrictions. Neither you nor any End User may use the Service Offerings in any manner or for any purpose other than as expressly permitted by this Agreement. Neither you nor any End User may, or may attempt to, (a) modify, alter, tamper with, repair, or otherwise create derivative works of any software included in the Service Offerings (except to the extent software included in the Service Offerings are provided to you under a separate license that expressly permits the creation of derivative works), (b) reverse engineer, disassemble, or decompile the Service Offerings or apply any other process or procedure to derive the source code of any software included in the Service Offerings, (c) access or use the Service Offerings in a way intended to avoid incurring fees or exceeding usage limits or quotas, or (d) resell or sublicense the Service Offerings. All licenses granted to you in this Agreement are conditional on your continued compliance this Agreement, and will immediately and automatically terminate if you do not comply with any term or condition of this Agreement. During and after the Term, you will not assert, nor will you authorize, assist, or encourage any third party to assert, against us or any of our affiliates, customers, vendors, business partners, or licensors, any patent infringement or other intellectual property infringement claim regarding any Service Offerings you have used. 9.3 Suggestions. I f you provide any Suggestions to us or our affiliates, we will own all right, title, and interest in and to the Suggestions, even if you have designated the Suggestions as confidential or proprietary. We and our affiliates will be entitled to use the Suggestions without restriction. You hereby irrevocably assign to us all right, title, and interest in and to the Suggestions and agree to provide us any assistance we may require to document, perfect, and maintain our rights in the Suggestions. 9.4 Hardware. Under no circumstances will you gain any proprietary rights in any computer hardware used by Ziftr or its affiliates. 9.5. Intellectual Property. We retain all right, title and interest in all of our intellectual property, including inventions, discoveries, processes, marks, methods , compositions, formulae, techniques, information and data, whether or not patentable, copyrightable or protectable in trademark, and any trademarks, copyrights or patents based thereon. You may not use any of our intellectual property for any reason, except with our express, prior, written consent. 10.1. General. You will defend, indemnify, and hold harmless us, our affiliates and licensors, and each of their respective employees, officers, directors, and representatives from and against any claims, damages, losses, liabilities, costs, and expenses (including reasonable attorneys’ fees) arising out of or relating to any third party claim concerning: (a) your or any End Users’ use of the Service Offerings (including any activities under your Ziftr account and use by your employees and personnel); (b) breach of this Agreement or violation of applicable law by you or any End User; or (c) a dispute between you and any End User. If we or our affiliates are obligated to respond to a third party subpoena or other compulsory legal order or process described above, you will also reimburse us for reasonable attorneys’ fees, as well as our employees’ and contractors’ time and materials spent responding to the third party subpoena or other compulsory legal order or process at reasonable hourly rates. 10.2. Process. We will promptly notify you of any claim subject to Section 10.1, but our failure to promptly notify you will only affect your obligations under Section 10.1 to the extent that our failure prejudices your ability to defend the claim. You may: (a) use counsel of your own choosing (subject to our written consent) to defend against any claim; and (b) settle the claim as you deem appropriate, provided that you obtain our prior written consent before entering into any settlement. We may also assume control of the defense and settlement of the claim at any time. 11.1 Risks. YOU understand that CRYPTOCURRENCY, ZIFTRCOINS, bitcoins, AND CRYPTOCURRENCY MINING are new and untested technologies outside of Ziftr’s control and adverse changes in market forces or technology will excuse ZIFTR’s performance under this agreement. In PARticular, and in addition to the terms of this document, you assume all risk of loss resulting from, concerning or associated with the risks set forth in the ziftrcoin risk disclosure. 11.2 Disclaimers. THE SERVICE OFFERINGS ARE PROVIDED “AS IS.” WE AND OUR AFFILIATES AND LICENSORS MAKE NO REPRESENTATIONS OR WARRANTIES OF ANY KIND, WHETHER EXPRESS, IMPLIED, STATUTORY OR OTHERWISE REGARDING THE SERVICE OFFERINGS OR THE THIRD PARTY CONTENT, INCLUDING ANY WARRANTY THAT THE SERVICE OFFERINGS OR THIRD PARTY CONTENT WILL BE UNINTERRUPTED, ERROR FREE OR FREE OF HARMFUL COMPONENTS, OR THAT ANY CONTENT, INCLUDING YOUR CONTENT OR THE THIRD PARTY CONTENT, WILL BE SECURE OR NOT OTHERWISE LOST OR DAMAGED. EXCEPT TO THE EXTENT PROHIBITED BY LAW, WE AND OUR AFFILIATES AND LICENSORS DISCLAIM ALL WARRANTIES, INCLUDING ANY IMPLIED WARRANTIES OF MERCHANTABILITY, SATISFACTORY QUALITY, FITNESS FOR A PARTICULAR PURPOSE, NON-INFRINGEMENT, OR QUIET ENJOYMENT, AND ANY WARRANTIES ARISING OUT OF ANY COURSE OF DEALING OR USAGE OF TRADE. WE AND OUR AFFILIATES OR LICENSORS WILL NOT BE LIABLE TO YOU FOR ANY DIRECT, INDIRECT, INCIDENTAL, SPECIAL, CONSEQUENTIAL OR EXEMPLARY DAMAGES (INCLUDING DAMAGES FOR LOSS OF PROFITS, GOODWILL, USE, OR DATA), EVEN IF WE HAVE BEEN ADVISED OF THE POSSIBILITY OF SUCH DAMAGES. FURTHER, NEITHER WE NOR ANY OF OUR AFFILIATES OR LICENSORS WILL BE RESPONSIBLE FOR ANY COMPENSATION, REIMBURSEMENT, OR DAMAGES ARISING IN CONNECTION WITH: (A) YOUR INABILITY TO USE THE SERVICE OFFERINGS, INCLUDING AS A RESULT OF ANY (I) TERMINATION OR SUSPENSION OF THIS AGREEMENT OR YOUR USE OF OR ACCESS TO THE SERVICE OFFERINGS, (II) OUR DISCONTINUATION OF ANY OR ALL OF THE SERVICE OFFERINGS, OR, (III) ANY UNANTICIPATED OR UNSCHEDULED DOWNTIME OF ALL OR A PORTION OF THE SERVICE OFFERINGS FOR ANY REASON, INCLUDING AS A RESULT OF POWER OUTAGES, MAINTENANCE, DEFECTS, SYSTEM FAILURES OR OTHER INTERRUPTIONS; (B) THE COST OF PROCUREMENT OF SUBSTITUTE GOODS OR SERVICES; (C) ANY INVESTMENTS, EXPENDITURES, OR COMMITMENTS BY YOU IN CONNECTION WITH THIS AGREEMENT OR YOUR USE OF OR ACCESS TO THE SERVICE OFFERINGS; OR (D) ANY UNAUTHORIZED ACCESS TO, ALTERATION OF, OR THE DELETION, DESTRUCTION, DAMAGE, LOSS OR FAILURE TO STORE ANY DATA. IN ANY CASE, OUR AND OUR AFFILIATES’ AND LICENSORS’ AGGREGATE LIABILITY UNDER THIS AGREEMENT WILL BE LIMITED TO THE GREATER OF (A) THE VALUE, IN UNITED STATES DOLLARS, OF THE BITCOINS YOU PAID US IN EXCAHNGE FOR ZIFTRCOINS IN THE PRESALE, OR (B) $50.00. YOU WAIVE YOUR RIGHT TO DEMAND the RETURN OF BITCOINS YOU PAID US IN the PRESALE UNDER ANY CIRCUMSTANCES, INCLUDING, WITHOUT LIMITATION, A DEMAND FOR SPECIFIC PERFORMANCE. 13. Modifications to the Agreement . We may modify this Agreement (including any Policies) at any time by posting a revised version on the Ziftr Site or by otherwise notifying you in accordance with Section 14.7. The modified terms will become effective upon posting or, if we notify you by email, as stated in the email. By continuing to use the Service Offerings after the effective date of any modifications to this Agreement, you agree to be bound by the modified terms. It is your responsibility to check the Ziftr Site regularly for modifications to this Agreement. We last modified this Agreement on the date listed at the beginning of this Agreement. 14.1 Confidentiality and Publicity. You may use Ziftr Confidential Information only in connection with your use of the Service Offerings as permitted under this Agreement. You will not disclose Ziftr Confidential Information during the Term or at any time during the 5 year period following the end of the Term. You will take all reasonable measures to avoid disclosure, dissemination or unauthorized use of Ziftr Confidential Information, including, at a minimum, those measures you take to protect your own confidential information of a similar nature. You will not issue any press release or make any other public communication with respect to this Agreement or your use of the Service Offerings. You will not misrepresent or embellish the relationship between us and you (including by expressing or implying that we support, sponsor, endorse, or contribute to you or your business endeavors), or express or imply any relationship or affiliation between us and you or any other person or entity except as expressly permitted by this Agreement. 14.2 Force Majeure. We and our affiliates will not be liable for any delay or failure to perform any obligation under this Agreement where the delay or failure results from any cause beyond our reasonable control, including acts of God, labor disputes or other industrial disturbances, electrical, telecommunications, hardware, software or other utility failures, earthquake, storms or other elements of nature, blockages, embargoes, riots, acts or orders of government, acts of terrorism, or war, changes in digital currency technology (broadly construed), changes in the digital currency industry or any other force outside of our control. 14.3 Independent Contractors; Non-Exclusive Rights. We and you are independent contractors, and neither party, nor any of their respective affiliates, is an agent of the other for any purpose or has the authority to bind the other. Both parties reserve the right (a) to develop or have developed for it products, services, concepts, systems, or techniques that are similar to or compete with the products, services, concepts, systems, or techniques developed or contemplated by the other party and (b) to assist third party developers or systems integrators who may offer products or services which compete with the other party’s products or services. 14.4 No Third Party Beneficiaries. This Agreement does not create any third party beneficiary rights in any individual or entity. 14.5 U.S. Government Rights. The Service Offerings are provided to the U.S. Government as “commercial items,” “commercial computer software,” “commercial computer software documentation,” and “technical data” with the same rights and restrictions generally applicable to the Service Offerings. If you are using the Service Offerings on behalf of the U.S. Government and these terms fail to meet the U.S. Government’s needs or are inconsistent in any respect with federal law, you will immediately discontinue your use of the Service Offerings. The terms “commercial item” “commercial computer software,” “commercial computer software documentation,” and “technical data” are defined in the Federal Acquisition Regulation and the Defense Federal Acquisition Regulation Supplement. 14.6 Import and Export Compliance. In connection with this Agreement, you will comply with all applicable import, re-import, export, and re-export control and regulations, including the Export Administration Regulations, the International Traffic in Arms Regulations, and country or individual-specific economic sanctions programs implemented by the Office of Foreign Assets Control. For clarity, you are solely responsible for compliance related to the manner in which you choose to use the Service Offerings. (a) To You. We may provide any notice to you under this Agreement by: (i) posting a notice on the Ziftr Site; or (ii) sending an email to the email address then associated with your account. Notices we provide by posting on the Ziftr Site will be effective upon posting and notices we provide by email will be effective when we send the email. It is your responsibility to keep your email address current. You will be deemed to have received any email sent to the email address then associated with your account when we send the email, whether or not you actually receive or read the email. (b) To Us. To give us notice under this Agreement, you must contact Ziftr by email to info@ziftrcoin.com. We may update this email address for notices to us by posting a notice on the Ziftr Site. Notices to us will be effective one business day after they are sent. 14.8 Assignment. You will not assign this Agreement, or delegate or sublicense any of your rights under this Agreement, without our prior written consent. Any assignment or transfer in violation of this Section 14.8 will be void. Subject to the foregoing, this Agreement will be binding upon, and inure to the benefit of the parties and their respective successors and assigns. 14.9 No Waivers. The failure by us to enforce any provision of this Agreement will not constitute a present or future waiver of such provision nor limit our right to enforce such provision at a later time. All waivers by us must be unequivocal and in writing to be effective. 14.10 Reformation and Severability. Except as otherwise set forth herein, if any portion of this Agreement is held to be invalid or unenforceable, the remaining portions of this Agreement will remain in full force and effect. Any invalid or unenforceable portions will be interpreted to effect and intent of the original portion. If such construction is not possible, the invalid or unenforceable portion will be severed from this Agreement but the rest of the Agreement will remain in full force and effect. 14.11 Disputes Resolution by Binding Arbitration; Jury Trial Waiver; Class Action Waiver; Limitation of Time. For any and all controversies, disputes, demands, claims, or causes of action between you and us (including the interpretation and scope of this Section and the arbitrability of the controversy, dispute, demand, claim, or cause of action) relating to the Service Offerings or this Agreement (as well as any related or prior agreement that you may have had with us), you and we agree to resolve any such controversy, dispute, demand, claim, or cause of action exclusively through binding and confidential arbitration. The arbitration will take place in the federal judicial district of your residence. As used in this Section, “we” and “us” mean Ziftr. In addition, “we” and “us” include any third party providing any product, service, or benefit in connection with the Service Offerings or this Agreement (as well as any related or prior agreement that you may have had with us) if such third party is named as a co-party with us in any controversy, dispute, demand, claim, or cause of action subject to this Section. Arbitration will be subject to the Federal Arbitration Act and not any state arbitration law. The arbitration will be conducted before one commercial arbitrator from the American Arbitration Association (“AAA”) with substantial experience in resolving commercial contract disputes. As modified by this Agreement, and unless otherwise agreed upon by the parties in writing, the arbitration will be governed by the AAA’s Commercial Arbitration Rules and, if the arbitrator deems them applicable, the Supplementary Procedures for Consumer Related Disputes (collectively, the “Rules and Procedures”). Where no claims or counterclaims exceed $10,000, the dispute will be resolved by the submission of documents without a hearing, unless a hearing is requested by a party or deemed necessary by the arbitrator, in which case, a party may elect to participate telephonically. You should review this provision carefully. To the extent permitted by applicable law, you are GIVING UP YOUR RIGHT TO GO TO COURT to assert or defend your rights EXCEPT for matters that you file in small claims court in the state or municipality of your residence within the jurisdictional limits of the small claims court and as long as such matter is only pending in that court. Additionally, notwithstanding this agreement to arbitrate, claims of defamation, and infringement or misappropriation of the other party’s patent, copyright, trademark, or trade secret shall not be subject to this arbitration agreement. Such claims shall be exclusively brought in the state or federal courts located in New Hampshire. Additionally, notwithstanding this agreement to arbitrate, you or we may seek emergency equitable relief before the state or federal courts located in New Hampshire in order to maintain the status quo pending arbitration and hereby agree to submit to the exclusive personal jurisdiction of the courts located within New Hampshire for such purpose. A request for interim measures shall not be deemed a waiver of the right to arbitrate. You and we must abide by the following rules: (a) ANY CLAIMS BROUGHT BY YOU OR US MUST BE BROUGHT IN THE PARTY’S INDIVIDUAL CAPACITY, AND NOT AS A PLAINTIFF OR CLASS MEMBER IN ANY PURPORTED CLASS OR REPRESENTATIVE PROCEEDING; (b) THE ARBITRATOR MAY NOT CONSOLIDATE MORE THAN ONE PERSON’S CLAIMS, MAY NOT OTHERWISE PRESIDE OVER ANY FORM OF A REPRESENTATIVE OR CLASS PROCEEDING, AND MAY NOT AWARD CLASS-WIDE RELIEF; (c) in the event that you are able to demonstrate that the costs of arbitration will be prohibitive as compared to the costs of litigation, we will pay as much of your filing and hearing fees in connection with the arbitration as the arbitrator deems necessary to prevent the arbitration from being cost-prohibitive as compared to the cost of litigation, (d) we also reserve the right, in our sole and exclusive discretion, to assume responsibility for any or all of the costs of the arbitration; (e) the arbitrator will honor claims of privilege and privacy recognized at law; (f) the arbitration will be confidential, and neither you nor we may disclose the existence, content, or results of any arbitration, except as may be required by applicable law or for purposes of enforcement of the arbitration award; (g) subject to the limitation of liability provisions of these Terms, the arbitrator may award any individual relief or individual remedies that are expressly permitted by applicable law; and (h) you and we will pay our respective attorneys’ fees and expenses, unless there is a statutory provision that requires the prevailing party to be paid its fees and litigation expenses and the arbitrator awards such attorneys’ fees and expenses to the prevailing party, and, in such instance, the fees and costs awarded will be determined by the applicable law. This Section will survive termination of your account and this Agreement as well as any voluntary payment of any debt in full by you or any bankruptcy by you or us. With the exception of subparts (a) and (b) above of this Section (prohibiting arbitration on a class or collective basis), if any part of this arbitration provision is deemed to be invalid, unenforceable, or illegal, or otherwise conflicts with the Rules and Procedures, then the balance of this arbitration provision will remain in effect and will be construed in accordance with its terms as if the invalid, unenforceable, illegal or conflicting part was not contained herein. If, however, either subpart (a) or (b) above of this Section is found to be invalid, unenforceable, or illegal, then the entirety of this arbitration provision will be null and void, and neither you nor we will be entitled to arbitration. If for any reason a claim proceeds in court rather than in arbitration, the dispute shall be exclusively brought in state or federal court located in New Hampshire. 14.12 Entire Agreement; English Language. This Agreement includes the Policies and is the entire agreement between you and us regarding the subject matter of this Agreement. This Agreement supersedes all prior or contemporaneous representations, understandings, agreements, or communications between you and us, whether written or verbal, regarding the subject matter of this Agreement. Notwithstanding any other agreement between you and us, the security and data privacy provisions in Section 4 of this Agreement contain the Parties and their affiliates’ entire obligation regarding the security, privacy and confidentiality of your personal information. We will not be bound by, and specifically object to, any term, condition or other provision which is different from or in addition to the provisions of this Agreement (whether or not it would materially alter this Agreement) and which is submitted by you in any order, receipt, acceptance, confirmation, correspondence or other document. If the terms of this document are inconsistent with the terms contained in any Policy, the terms contained in this document will control. If we provide a translation of the English language version of this Agreement, the English language version of the Agreement will control if there is any conflict. “End User” means any individual or entity that directly or indirectly through another user accesses or uses the Service Offerings under your account. The term “End User” does not include individuals or entities when they are accessing or using the Service or any Content under their own Ziftr account, rather than your account. “Ziftr Confidential Information” means all nonpublic information disclosed by us, our affiliates, business partners or our or their respective employees, contractors or agents that is designated as confidential or that, given the nature of the information or circumstances surrounding its disclosure, reasonably should be understood to be confidential. Ziftr Confidential Information includes: (a) nonpublic information relating to our or our affiliates or business partners’ technology, customers, business plans, promotional and marketing activities, finances and other business affairs; (b) third-party information that we are obligated to keep confidential; and (c) the nature, content and existence of any discussions or negotiations between you and us or our affiliates. Ziftr Confidential Information does not include any information that: (i) is or becomes publicly available without breach of this Agreement; (ii) can be shown conclusively by documentation to have been known to you at the time of your receipt from us; (iii) is received from a third party who did not acquire or disclose the same by a wrongful or tortious act; or (iv) can be shown conclusively by documentation to have been independently developed by you without reference to the Ziftr Confidential Information. “Ziftr Content” means Content we or any of our affiliates make available in connection with the Service or on the Ziftr Site to allow access to and use of the Service. Ziftr Content does not include the Service . “Ziftr Site” means http://www.ziftrcoin.com and any successor or related site used by us. “Policies” means the Site Terms, all restrictions described in the Ziftr Content and on the Ziftr Site, and any other policy or terms referenced in or incorporated into this Agreement. Policies does not include whitepapers or other marketing materials referenced on the Ziftr Site. In the event of a conflict between any Policy and this Agreement, the terms of this Agreement prevail. “Service” means each of the services made available by us or our affiliates, including, without limitation, the ziftrCOIN Wallet. “Service Offerings” means the Service, the Ziftr Content, the Ziftr Site, and any other product or service provided by us under this Agreement. Service Offerings do not include Third Party Content. “Site Terms” means the terms of service located at http://www.ziftrcoin.com/terms-conditions/, as they may be updated by us from time to time. “Suggestions” means all suggested modifications, improvements, additions or subtractions to the Service Offerings that you provide to us. “Third Party Content” means Content made available to us or to you by any third party in conjunction with the Service, including but not limited to any hosted wallet services or mining pool services. “ziftrCOIN Wallet” means the web-based digital currency software provided by us that enables the storage, receipt and transmission of ziftrCOINs and/or other digital currencies. Copyright 2014-2019 ziftrCOIN, LLC owned and operated by myVBO, LLC, All rights reserved.